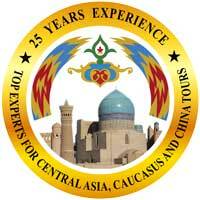 Silk Road Treasure Tours has your Adventure Travel Bucket List ready! Add these stunning, must-see destinations to your itinerary through the Silk Road and surrounding regions. Include UNESCO World Heritage sites and legendary Silk Road cities, gems of medieval architecture and ancient ruins thousands of years old where the likes of Alexander the Great, Marco Polo, and Tamerlane once walked, awe-inspiring landscapes, fascinating cultures and fabulous traditional hospitality. 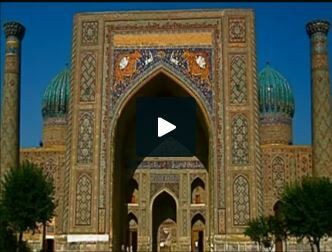 Welcome to these legendary Silk Road cities of Uzbekistan: Samarkand and Bukhara. Millennia of history, soaring Islamic architecture, sun-baked adobe walls, twisting medieval alleyways and bustling bazaars offer travelers their own Thousand and One Nights! There is something for everyone in these crossroads of the Silk Road. 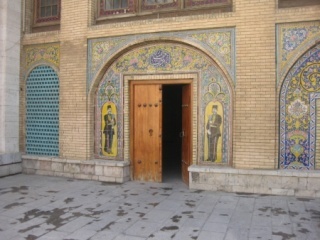 Konye-Urgench was one of the centers of the Islamic world in the 12th century. Its ruins lie just south of the Amu-Darya River, untouched for centuries and one of the most important archaeological sites in Turkmenistan, full of history and rich in culture. At the Akhal Teke farm you can experience the legendary horses of Turkmenistan! Known for their shiny golden coats, graceful stance, and matchless endurance, Akhal Teke have been the mainstay of the nomadic Turkmen and prized among horse breeders for centuries. Khodjand is second largest city in Tajikistan. Built at the mouth of the Fergana Valley, the lush landscapes herald the region's agricultural significance. The Fann Mountains are part of the Pamir range, close to the border of Uzbekistan. Renown for their majestic beauty, the peaks, glaciers and pristine lakes are a dream for hikers. The Tien Shan mountains in Kyrgyzstan are a formidable range of high peaks, densely forested valleys, and extensive wilderness providing incomparable trekking on foot and horseback, rafting, and adventure travel. Horses are an integral part of the Kyrgyz culture and traditional games and competitions on horseback are exciting events not to be missed! The Silk Road routes east included stops at ancient cities like Turpan. Set in the huge dry basin of a salt lake, it was an important trading center and local Uygur hospitality still welcomes travelers. This lush oasis city is a piece of Central Asia in China, where walls seem to sprout raisins as they dry in the sun and women in traditional robes lead donkeys past adobe homes and colorful mosques. 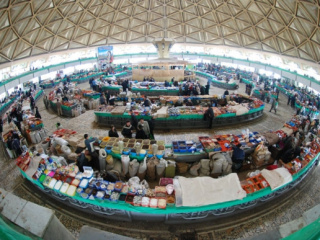 These same ancient Silk Road routes will take you to the brilliant Sunday bazaar of Kashgar in the westernmost city in China. Everything imaginable is for sale and on display from a Bactrian camel to a bolt of bright ikat pattern cotton or crimson tribal carpet. Perched atop a mountain in Georgia is the lovely town of Signagi, with its 18th century walls and Georgian churches. This is the place to stop and enjoy local Kakhetian food and wine along the country's wine routes. Tblisi has been the capital city of Georgia since the 6th century and part of the Silk Road border between Europe and Asia. It exemplifies the blend of cultures here with its mix of European city planning, Soviet and medieval architecture, and it's rich heritage of art and cuisine. Armenia is said to be the cradle of Christianity, and Etchmiadzin is one of the most visited cities in the region. Both pilgrims and tourists come to visit its fabulous church architecture. The cathedral is said to be the oldest in the world, built in the year 303. Areni is the destination for Armenian wine. Archaeological evidence shows over 6,000 years of viticulture. The Persian capital Baku was the Paris of the East in the late 19th and early 20th century, created by oil and driven by politics and nationalism. The Old City encompasses the walled sections of the medieval town including the Palace complex of the Shirvanshah Dynasty and the remains of the 12th century Maiden Tower. On the other side, modern Baku is a thriving, exciting world-class city. Iran celebrates the arrival of spring and the New Year with Nowruz; 12 days of family gatherings and parties to ensure a full and happy year ahead. Iran is an unspoiled tourist delight with 19 UNESCO sites, unparalleled gems of Islamic architecture, fabulous ruins of ancient empires and bold landscapes of desert and valley. Learn about this warm and welcoming country on the Silk route from modern Tehran, through ancient Shiraz and Persepolis, Zoroastrian Yazd and majestic Isfahan. More perfect travel weather in the fall coincides with the saffron harvest and some of the best Persian cuisine you’ll ever experience!